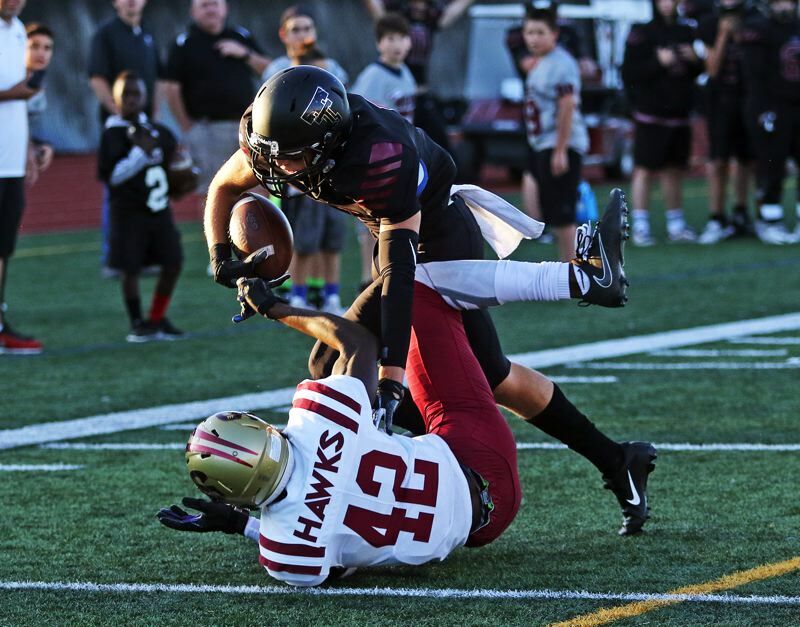 The Tualatin High School football team did it all. And, the Timberwolves did them all really, really well. They also got an impressive win to show for it. 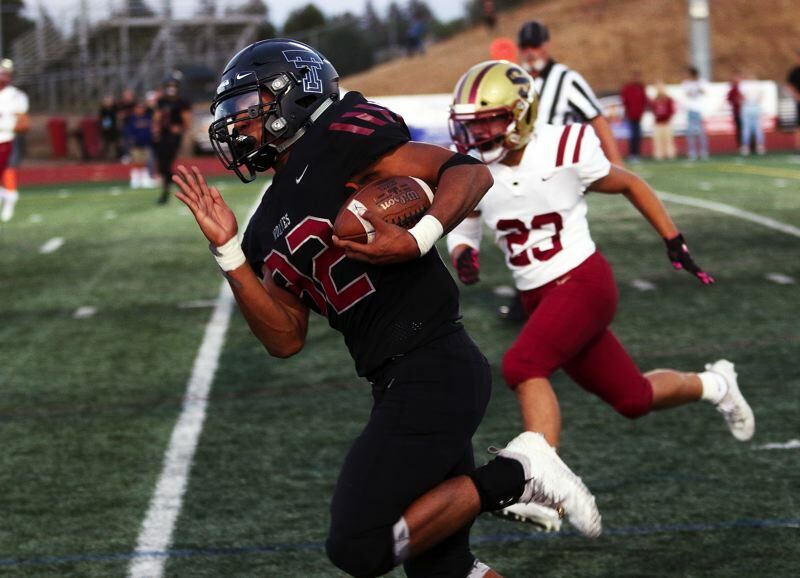 Tualatin, excelling in all phases of the game, rolled to a 47-7 win over Southridge in a season-opening non-league game played Friday at Tualatin High School. 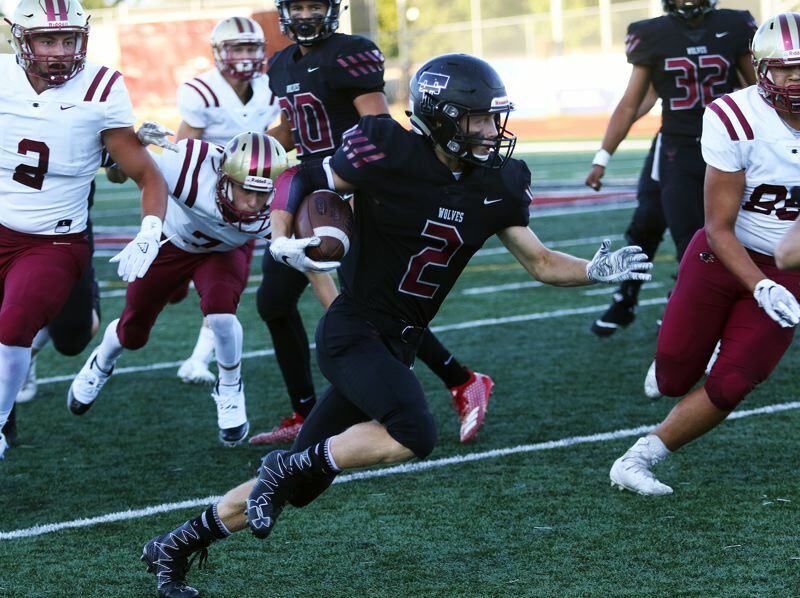 "We've been grinding since Day 1," said Tualatin senior Jett Searle, who had both an interception and a punt return for a touchdown in the victory. "This team wants to work. We put in the work and it paid off tonight." "This was great," said Tualatin senior linebacker Garrett Boespflug, who had three first-half quarterback sacks. "We just played our hearts out, did our best and did what our coaches told us to do. We ran the fundamentals." 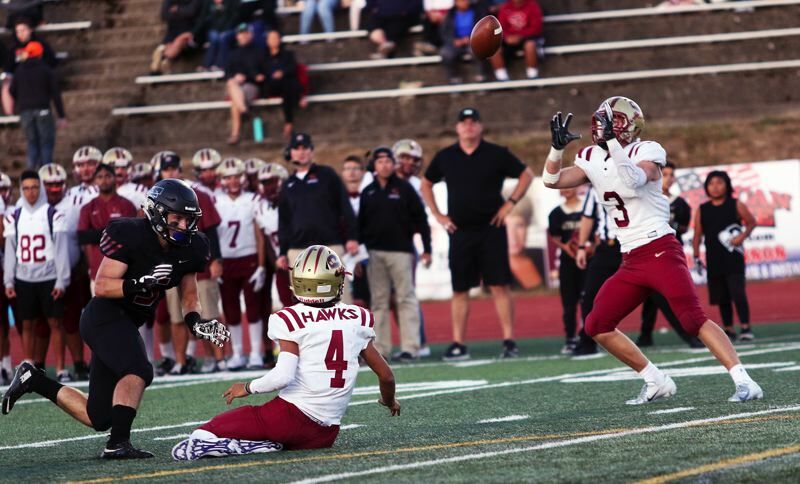 "Amazing," Tualatin senior quarterback Kyle Dernedde said with a smile. "It was awesome. We came out and made some noise. We weren't favored to win this game, but we came out on top. It was unbelievable." The Timberwolves were efficient on offense in the win, rushing for 286 yards and passing for 111 more. And, Dernedde said, the key to that was the offensive line. "Our line did an unbelievable job," Dernedde said of the group that included senior Quinn McCarthy, senior Gavin Moore, senior Dane Norlin, junior Cody Van Meter and junior Brett Gydesen, among others. "A lot of people doubted our line coming into the season, but they were unbelievable." 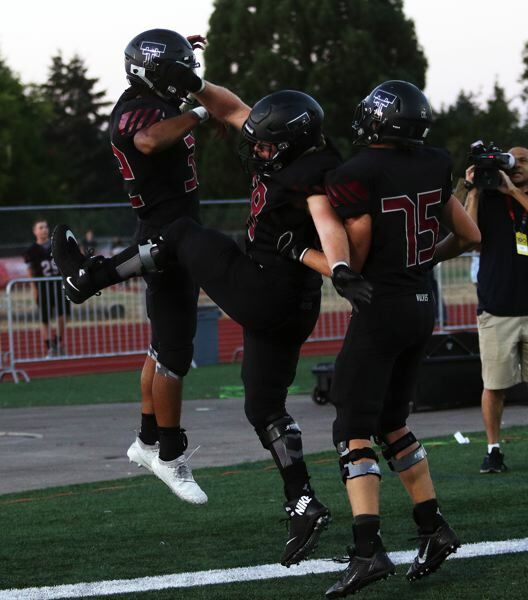 Meanwhile, the Tualatin defense came up with four turnovers and six quarterback sacks. "I tried my hardest, as well as everyone else on the team did," Boespflug said. "All 11 of us rallied to the ball." "We really executed on defense, held them to seven points, that they got in the fourth quarter," Searle said. "Our special teams executed. We just all put it together." On the other side, Southridge is looking to learn from the setback. 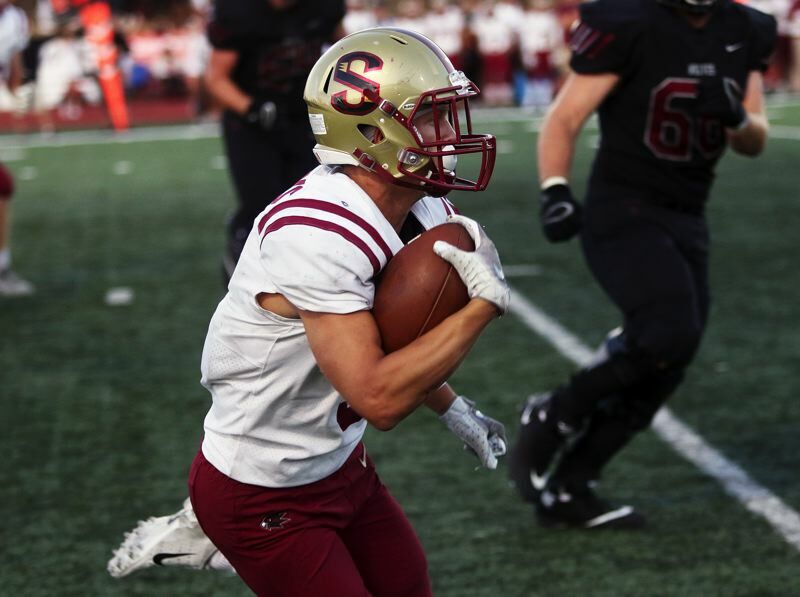 "We came out a little bit flat tonight, and, obviously, that's not how we wanted to start it," said Skyhawk junior receiver Joshua Calo, who had seven receptions in the contest. "I think in practice, we'll amp it up and try and get that game speed going. You just have to be ready every play. That team, they obviously were ready and they came full speed at us. We just have to attack and make plays." "We'll definitely learn from this game," Southridge senior running back Blake Sims said. "We just need to re-coop and bring it back together as a team and learn from this." 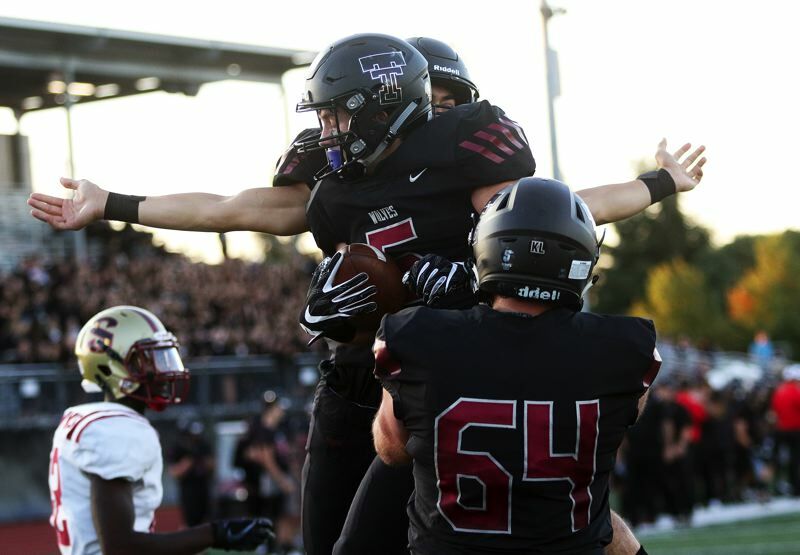 Tualatin, in Friday's opener, seemed to be fired up right from the start — and it showed. The first time the Timberwolves had the ball, they moved 60 yards in nine plays, capping off the drive with a 6-yard touchdown run by junior Luke Marion, giving the home team a 6-0 lead with 9 minutes and 5 seconds left to play in the first quarter. 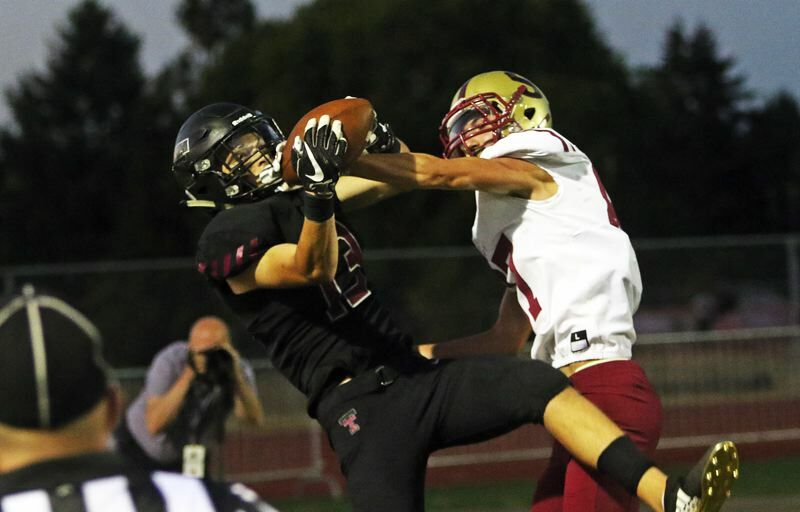 The Tualatin defense then came up with its first big play, as senior cornerback Caden Dickson made a leaping interception at the Timberwolf 27-yard line. 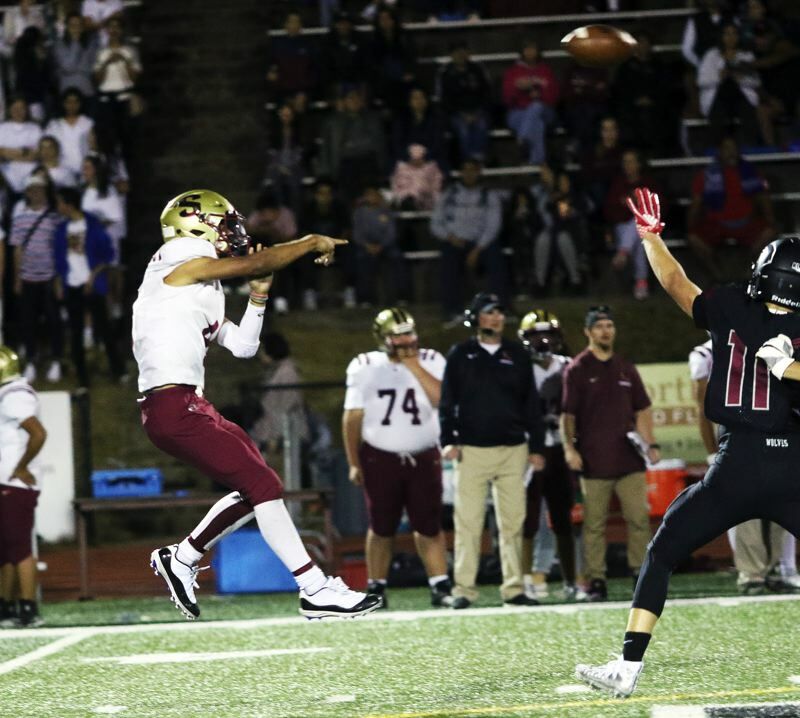 The turnover, as well as a 48-yard run by Dernedde, helped set up a 7-yard touchdown pass from Dernedde to senior tight end Jalen Hale, giving Tualatin a 12-0 lead with 5:09 remaining in the opening period. Senior running back Kyle Kamp capped off the next Tualatin offensive possession with a 2-yard touchdown run, upping the margin to 19-0 with 2:42 still remaining in the first quarter. Another big defensive play set up the next Tualatin score. This time, it was junior linebacker John Miller intercepting a Southridge pass, and returning the ball 54 yards to the Skyhawk 20-yard line. Three plays later, senior running back Dominique Loggins scored on a 17-yard run, pushing the lead to 26-0 with 9:12 left in the second quarter. Tualatin was able to score again right before halftime. Dernedde and Hale teamed up again, this time with the tight end making a leaping catch of a fade pass to the left side of the end zone got s 14-yard scoring play, coming with 39 seconds left in the half. "That ball, the fade to the end zone, that worked out," Dernedde said. "It was an unbelievable catch." Hale's second touchdown of the half gave Tualatin a 33-0 lead at the intermission. The Wolves showed no letdown early in the third quarter. 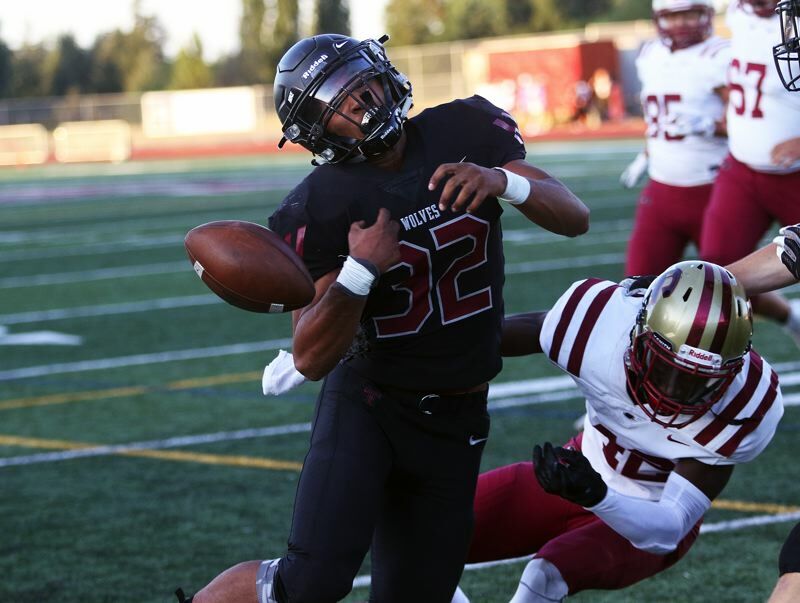 The Tualatin defense, getting tackles for losses by junior Blake Jackson and Norlin, forced Southridge into a three-and-out and a punt. Searle took over from there. Fielding a 29-yard punt on the Skyhawk 42-yard line, Searle sprinted down the right sideline to the end zone for a touchdown that made the score 40-0 with 10:35 remaining in the period. "He kind of kicked it to the right side, short, and I just kind of grabbed it," Searle said. "My blockers set it up well for me, and I took it to the house." Tualatin's final touchdown of the game came on 25-yard run by junior Josh Boespflug, coming with 2:20 left to play in the third quarter. 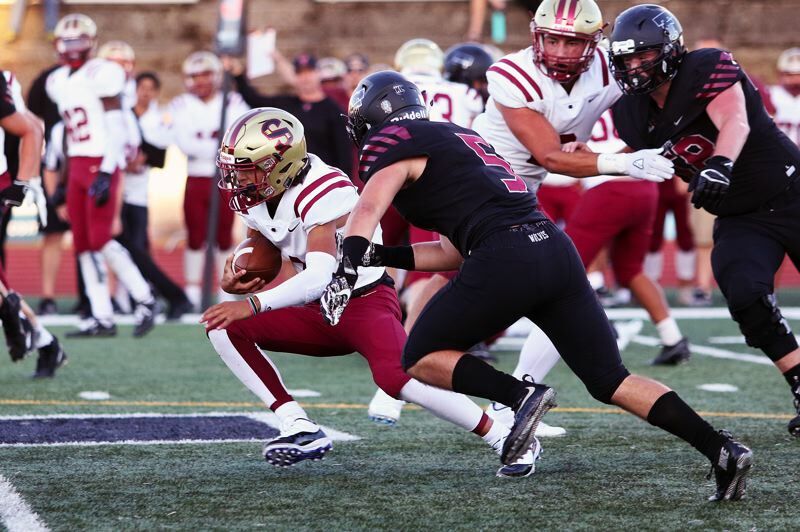 Southridge got on the scoreboard when freshman backup quarterback Dominic Menegas threw a 12-yard touchdown pass to junior Katsuo Steward with 1:38 left in the game, making the final score 47-7. "We were able to execute when we had the opportunities," Dernedde said. "We have a lot of weapons and a lot of guys who can make a difference." Loggins led the Tualatin rushing attack with 104 yards on 12 carries, all coming in the first half. Josh Boespflug added 75 yards on seven carries, all coming in the second half. Dernedde ran for 49 yards on three carries. Dernedde also completed nine of 11 pass attempts for 75 yards. Hale had three catches for 36 yards and Kamp had two receptions for 40 yards. "We were able to run it or pass it, whatever they gave us," Dernedde said. "We kept them on their toes." 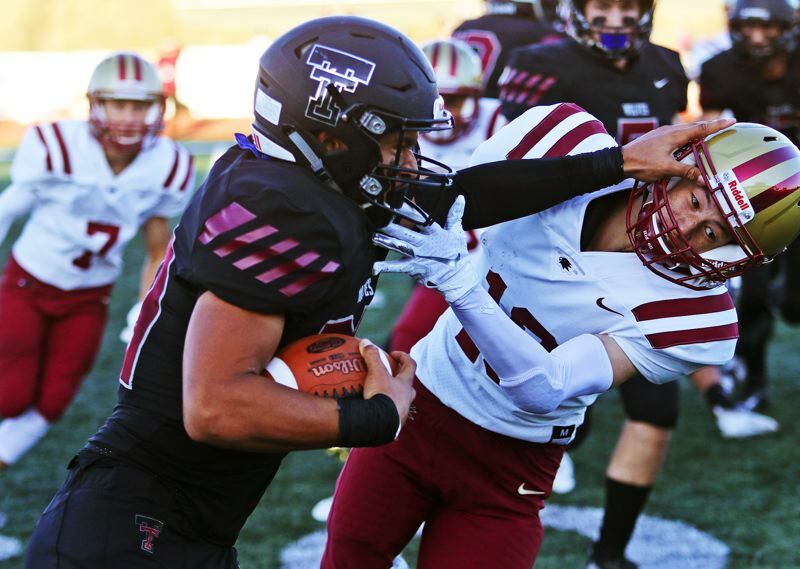 For the Tualatin defense, Garrett Boespflug had a tackle for a loss to go with his three quarterback sacks. "I just tried to get through the hole, get to the ball and get him to the ground," he said of the quarterback sacks. "It was great — lights out." Also for the Tualatin defense, Van Meter had a sack and a tackle for a loss. Senior Quinn McCarthy and junior Jake Reser each had a quarterback sack. Jackson, Norlin and Josh Boespflug each had a tackle for a loss and sophomore Casey Raz recovered a Southridge fumble. "We were excited for this," Searle said. "In practice, we don't get to hit our own teammates, so we were happy we got to go out and hit somebody." For Southridge, junior quarterback Darik Salinas completed 25 of 45 pass attempts for 117 yards. Calo gained 39 yards on his seven receptions. Sims had 18 yards on six catches and senior tight end Kade Hustler had five catches for 25 yards. Senior E.J. Santos led the Skyhawks rushing attack with 20 yards on three carries. Sims had 14 yards on five carries. For the Southridge defense, junior Joseph Weaver had a quarterback sack. "We had some things that we liked, and that we can take away," Calo said. "But we just have to be more prepared and come out with a win next week." "We didn't play as a team tonight," Sims said. "Our endurance wasn't there, and we'll correct that. This definitely is motivation." Both teams will be back in action on Sept. 7. Tualatin will travel to play Oregon City and Southridge will travel to Lincoln. Both of those games are set to start at 7 p.m.